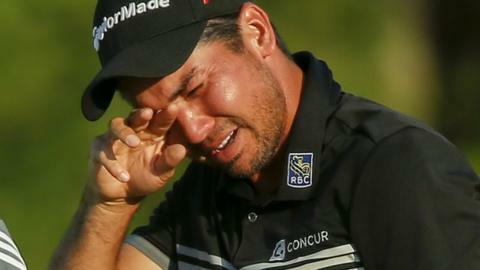 Jason Day believes his previous near misses prepared him to hold his nerve and win the US PGA Championship. The Australian, 27, had finished in the top four at six majors before his victory at Whistling Straits on Sunday. "I've seen multiple mental coaches," said Day. "But the biggest thing that prepares you for something like this is the sheer experience of failure. "Looking at it as a positive and knowing you can learn from anything - that really gets you mentally tough." Day won with a score of 20 under par, which broke Tiger Woods's major record of 19 under at the 2000 Open Championship. "Augusta in 2013 when I had the lead on 16, that was a tough one to finish and get over," said Day, as he recalled bogeying two of the final three holes to fall out of contention at the Masters two years ago. "But if I didn't have that failure I wouldn't be standing here with this trophy." The Queenslander began the final day with a two-stroke lead and he held off the challenge of American Jordan Spieth to earn a win which had him tears on the final hole. "It was probably the hardest round of golf I have ever had to play," he said. "I knew it was going to be tough but I didn't realise how tough." Day went into the final round of this year's US Open and the Open Championship with a share of the lead before failing to kick on for victory. "I really thought my first major championship was going to be at The Open this year," said the world number five. "You flip it now and I am here at the PGA Championship with the amount of emotion that has come out of me." He added: "I still want to accomplish that number one goal of mine which is to be the best player in the world. "I'm still very motivated and hungry to do that."